Countless book have been written on the Beatles with just about every aspect of their lives and careers touched upon. While their music has obviously been most heavily covered, there have also been numerous books about their fashion, relationships, solo careers, and influence. Thus, any time a new Beatles book comes on the market, it has to be very interesting and look at the band from a completely different angle in order for me to be interested. 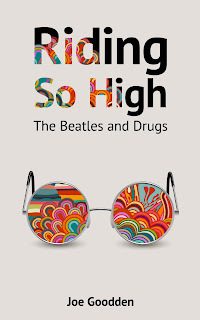 The new book Riding So High: The Beatles and Drugs checks both of those boxes. In this book, author Joe Goodden has decided to look at the Beatles story through the lens of their drug use. Before anyone thinks that this book in any way glorifies drug use, let me assure you that it does not. Goodden states as much in his introduction and having read it myself, I can confirm that this is the case. It instead takes a scholarly approach at describing the Beatles' drug usage and how it informed and influenced their music and the relationships in the band. By remaining impartial and not passing judgments in either direction, the author has managed to write a book that is both informative and fascinating. The central premise of this book is that the Beatles story is inextricably linked to their drug use, from their beginnings in Liverpool through the band's career, split, solo careers, and beyond. Riding So High is written such that each chapter is its own section dealing with a specific drug. There are chapters dealing with tobacco, alcohol, amphetamines, marijuana, LSD, cocaine, and heroin. They're laid out in that order as well, from least harmful (relatively speaking) to most harmful, which also follows the general arc of when they entered the Beatles' orbit (which itself is no coincidence). While the chapters about tobacco and alcohol are somewhat innocuous, it's starting with the chapter on their amphetamine use where the book really starts to get interesting and begins to put their career into context through the lens of their substance use. Beat poet Royston Ellis first showed the band how to extract the Benzedrine from inhalers, but in a new revelation, it turns out Jane Asher's father, Dr. Richard Asher, also showed this trick to Paul after he moved into their house in 1963. From here, the Beatles fueled their grueling nights playing for hours on end in Hamburg and Liverpool with German amphetamine-based diet pills called Preludin. As they became famous and the demands of Beatlemania began to punish them mentally and physically, they remained indebted to speed in order to keep pace with their schedule. Eventually, pep pills gave way to strong amphetamines like Black Bombers and Purple Hearts, both of which became very popular with the Mod subculture in early 1960s London as well as with the hip crowd and rock cognoscenti of the era. Another big revelation in perhaps the longest chapter, on marijuana, is that contrary to the legend that they first smoked it with Bob Dylan on their 1964 US tour, they had in fact tried it as far back as 1960. However, at that time they associated it more with jazz and folk musicians and didn't seem to care for it; there were also claims from the Beatles and those around them that they didn't really notice an effect from it. However, that all changed after the encounter with Dylan, and if one drug could be said to have influenced the Beatles' music more than any other, it would be marijuana. It was certainly the one substance all four of the band members used for the longest period of time. All of them grew to use it habitually, none more than Paul McCartney. His many brushes with the law (including the Japanese bust in January 1980) became infamous and it wasn't until the early 2000s that he finally announced he'd quit smoking it. LSD is the one other drug the Beatles are most commonly associated with, especially during their psychedelic period in the 1960s. While again, all four of them used it, it was George and most notably John who were regular users. Ringo was a less frequent tripper while Paul was the last one to use it and only a handful of times during the band's lifetime. While LSD opened up spiritual doors for George that lasted the rest of his life, for Lennon his daily usage of the drug for nearly two solid years led to ego death, reduced productivity, lessened aggression, a lack of confidence in his abilities, and some episodes that can be characterized as drug-induced psychosis. The return of his "normal" personality after he ceased regular use of the drug in late 1968 was anything but coincidence. Even more interesting were the two chapters dedicated to substances the Beatles used (and are associated with) the least . Cocaine was only really used by Paul during the Beatles years of 1967 and 1968 and he stated quite clearly that he didn't much like it. In the post Beatle years, the other three indulged in it quite a bit. As for heroin, while Paul tried it once, John was the only one who used it regularly, and he and Yoko became full-blown junkies shortly after beginning their relationship in 1968. If one drug can be said to have actually had an impact on the end of the band, it would be heroin. While there were certainly numerous other contributing factors to the split, heroin did play a part as it sapped most, if not all of John's enthusiasm, energy, and productivity as a Beatle. While he somewhat spuriously blamed the UK press and the other three Beatles themselves for why he and Yoko started taking heroin, the book does shed light on the fact that it was a few years into the 1970s before he and Yoko finally got the monkey off their backs. After the chapters detailing individual drugs are additional chapters describing how substance use affected the four Beatles' solo careers and lives from the split to the present day. One of best things about Riding So High is that the author maintains an objective and dispassionate voice throughout, never glorifying, condoning, or making light of the Beatles' drug use. Rather, Goodden only shows how their drug use influenced their behavior, relationships, and of course their music. The book has a lot of interesting new tidbits that kept even a longtime Beatles obsessive like me engaged and informed (and with as much minutiae on the Beatles as I know, that's no easy task!). One common thread that ran throughout the book was the cautiousness of Paul McCartney. Alone among the four Beatles, he routinely was the last to try something and, with the exception of marijuana, was the lightest user of said substance. The author also does a great job of following each Beatles' drug use and the consequences of their behavior into their solo careers, from Paul's multiple marijuana busts to Ringo's alcoholism, George's cocaine binges, and John's out of control behavior during his "Lost Weekend" of 1973-1975. Unique among Beatles book in the angle it takes in telling their story, Riding So High: The Beatles and Drugs is one of the most interesting and informative new Beatles books I've read in years. I highly recommend it to any Beatles fan, including seasoned Beatles fans and scholars. I thoroughly enjoyed this book and I am confident any Beatles fan will, too. Have always been a Beatles fan like you, & having just seen Howard's doco `Eight Days a Week' (yeah, late I know) was fascinated to read this book review. Enjoyed the videos too. Hey Ian, nice to hear from you! Hope all is well with you! Thanks for the kind words on the review. It's a great book...if you're interested in reading it, I highly recommend it.